Your floor is a valuable investment. With proper care and maintenance, you are able to enjoy it for years to come. Protect your wood's timeless aesthetic appeal with floor refinishing and restoration services by Upchurch's Hardwood Flooring. Our services are available to commercial and residential customers in and around the Tri Cities of East Tennessee as well as Western North Carolina. 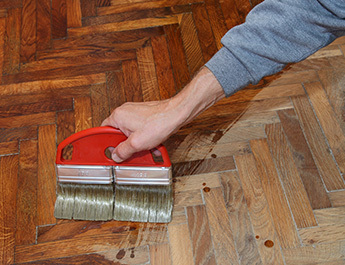 Whatever the condition of your wood flooring, our dedicated team is ready to restore it to its old glory. We treat worn floors and faded finishes, and even repair damaged sections. Our specialists take great care to revive those nestalgic floors of days gone by. Each restoration service begins with a free estimate. Our restorers carefully inspect your flooring and determine the best course of action. In addition, you are more than welcome to make special requests. You can even ask for a simple layer of top coat. We are more than happy to accommodate our services to your specific needs. As your dedicated floor restorers, we spare no expense in ensuring each job is performed correctly the first time, every time. We specialize in dust control sanding; so whenever we work on your property, we always make a point to maintain a clean work space. As its name suggests, dust control sanding contains, and removes, dust that has accumulated on your hardwood floor. It drastically reduces the presence of airborne irritants and keeps your home clean during, and after, the maintenance process. We are the first company in the area to offer this service. Our commitment to quality means you never have to worry about excessive dust or irritants when you work with us. We also offer green, environmentally friendly, and low-odor finishes with every service.